Raffi is 3 months old! 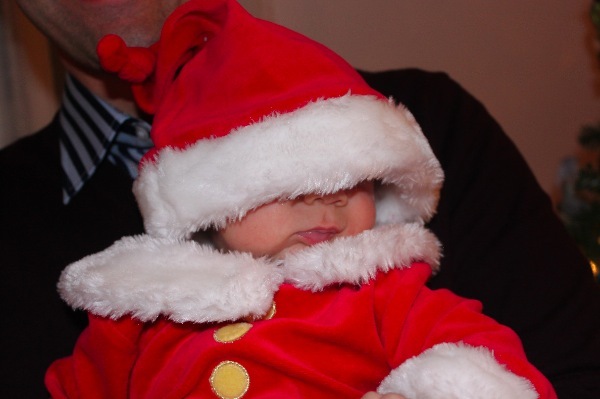 So much excitement this month with the holidays. Raffi and I visited RI for an entire week. He loved the ride and only cried once for about 2 minutes, but the first night was rough. 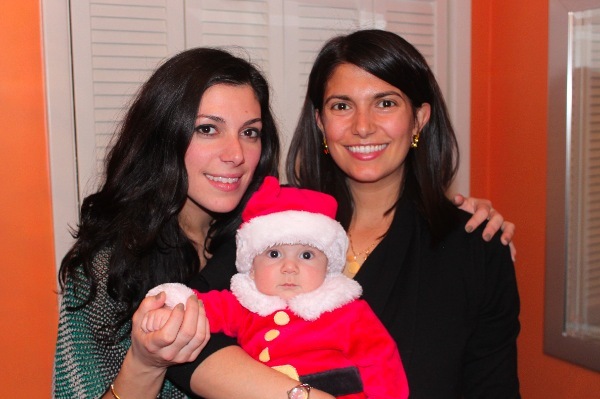 He loves visiting with his aunties, uncles, cousins, and nonna bis (my nonna) as well as friends. We had lots of smiles and chatter starting that week. It was so fun. He was a spoiled prince with lots of entertainment, snuggles, gifts, and interaction. We took him off his strict schedule and bedtime routine over the holidays, and he seems to be doing really well with us just winging it. Some days it seems he needs more structure than others. New Year’s Eve Raffi partied until 2 in the morning at the big Philly dance, and he loved all the music. 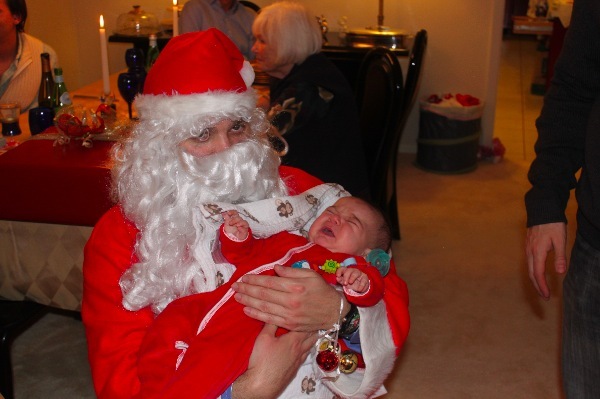 Actually, he loved it so much he slept through half of it! We still want to get him on a strict nap schedule, but he doesn’t seem ready for longer naps. He is very much so a cat napper and needs about 5 shorter naps during the day. After going back and forth on how to stop the swaddle, we decided to go cold turkey. I explain more about that in my latest Babycenter post. Check it out here! 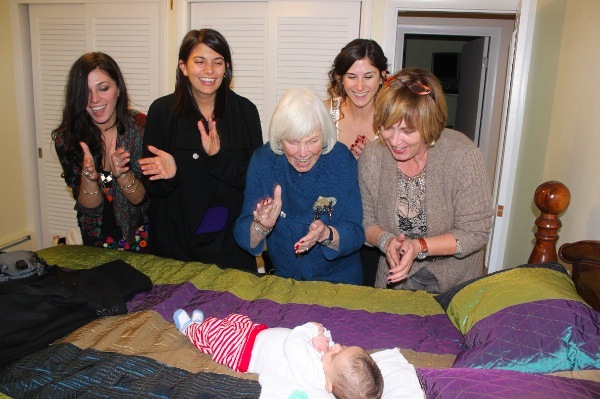 Without swaddling and with all of his big boy outfits, Raffi is now officially a baby and not a newborn. So sad! Luckily he has become even more snuggly than before. 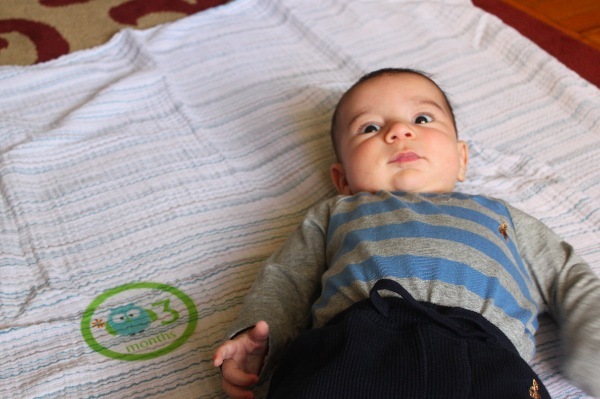 Tummy time is now a struggle when it used to be easy, but we push through it. Sometimes Raffi will roll from belly to back, and sometimes he just puts his head down and cries. Still other times he will just hang out looking around for a solid 10 minutes. He has great head control now, and you can’t hold him facing in when he’s awake. He MUST be able to see everything that is going on or he cries. Nursing is still easy, and we made it through a fairly intense growth spurt without problem. Raffi gets distracted sometimes, and I love to watch him take a break to look around at the surroundings before he remembers he’s hungry and comes back to eat. Nursing laying down has helped R learn to roll from back to side and back again over and over. He is becoming really good at it. Being a mom is still challenging for me at times. While others make it look so easy, I struggle now and again. I have a tough time feeling energized and not overwhelmed. I constantly feel like I have too much on my plate and I don’t know how to manage better. I hope that with time it gets easier to figure out how to do it all. I still hate pumping and I hate giving R bottles. I feel like it is a lot more work, and I’d rather just make myself available every time R needs to eat. We make sure he gets at least 1 bottle a week, but since that requires thawing milk, making a bottle, giving a bottle, pumping, and cleaning bottle and pump parts I often avoid it. Raffi is still stingy with his smiles with me, but he will smile a lot for his dad and others. I often feel like I’m just the moo cow and he sees me for food only, but then when he’s screaming and I’m the only one he will quiet down for I feel better. I like to feel needed for more than just food. It’s fun to see how Trig and I turned out as parents. It’s seems like he is way more of a softie than I am. Raffi will lose his pacifier over and over again and I patiently wait while he tries to figure out how to get it back in his mouth, even if it involves some tears. Trig, on the other hand, can’t stand the tears and gives him the pacifier right away so he doesn’t suffer. Both approaches are ok with me, and it’s interesting to see how different we are. At the same time, Trig likes to let Raffi learn to play independently while I always feel that he needs constant interaction. Talking, singing, and reading are all super fascinating right now. Raffi stares at our mouths and tries to repeat sounds. He especially likes when he read to him and just stares back and forth between the pretty colors of the book and our mouths. 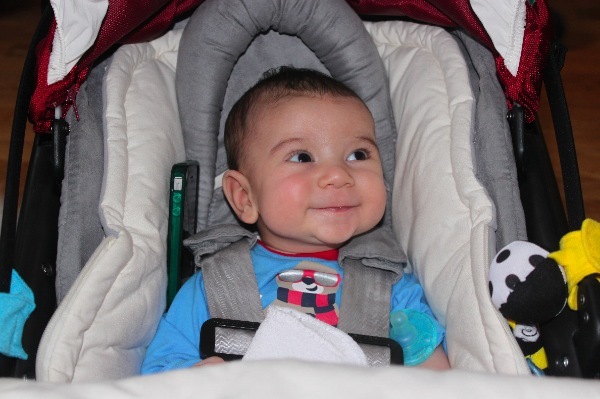 Raffi loves his new baby carrier (the Britax- it’s awesome and so easy to use) as well as sitting in his new Boppy. We thought we didn’t need one, but man does he love lounging on it or sitting up in it. Poopsplosions: Rare, but we had one really good one that went out the diaper, through his pants and on to his daddy’s sweatpants. Lovely. Happy 3 months, Raffi!!! It goes my So fast! I can’t believe Ella will be 8 months tomorrow! What a cutie he is! He’s seriously getting cuter with each update! And what a good baby! Only cried once on your car ride to RI! Wow! Lucky!! Ella LOVES 10 little ladybugs! She loves to grab at them on each page. He is precious, Sabrina! I’m so happy for you guys! i can’t even believe how fast time is flying. i love his mohawk!! I agree, the mohawk is too cute! And don’t worry, we all get overwhelmed sometimes. How is he three months old already?! Such a little man! And I think you’re doing great…being a mommy is a big job! He is adorable! 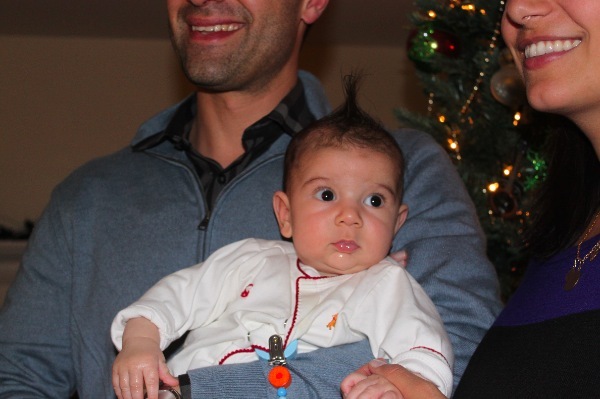 He looks like both of you and the mohawk is pretty awesome! It sounds like you guys are in a real groove and 3 months is such a fun age when they are becoming more interactive. Makes me so excited to have my own this May! In other news, I feel like it took the entire first year of Lucy’s life for me to get it together and get into the swing of being a mom. Even though some people make it look easy, I don’t think it is easy for any of us, you know? Hang in there my dear. cutie pie! 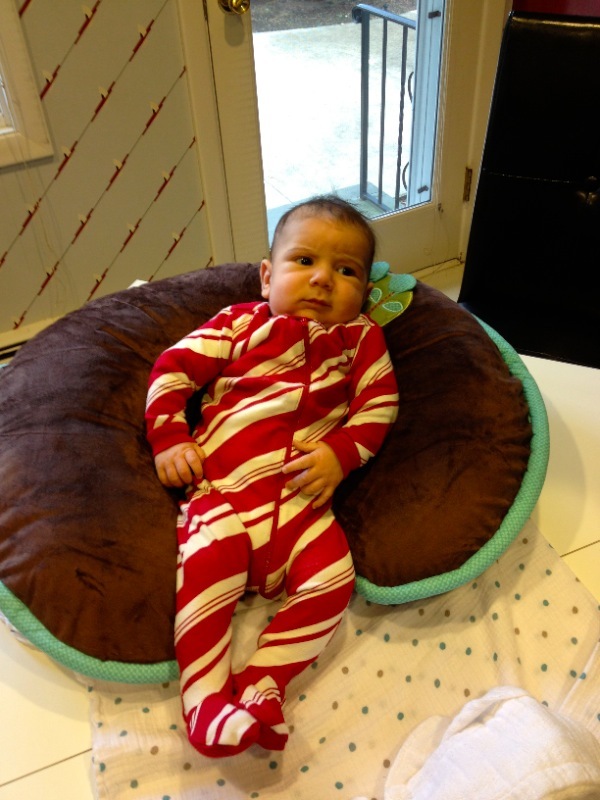 Love the peppermint PJs! Beautiful baby! 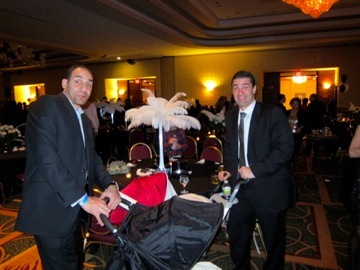 I think it sounds like you are doing a wonderful job with Raffi! Motherhood may seem overwhelming at times, but so worth it! I enjoy reading all of your blog posts. My son is almost 7 months old. For what it’s worth, when I read your posts, I always think that you make it look so easy! I love all of your schedules. I had a hard time when my son was first born and I still have a hard time feeling energized sometimes. But it’s comforting to know that those feelings are normal and others are experiencing the same thing. Best of luck to you and your beautiful family. Omg, your photos are killing me! 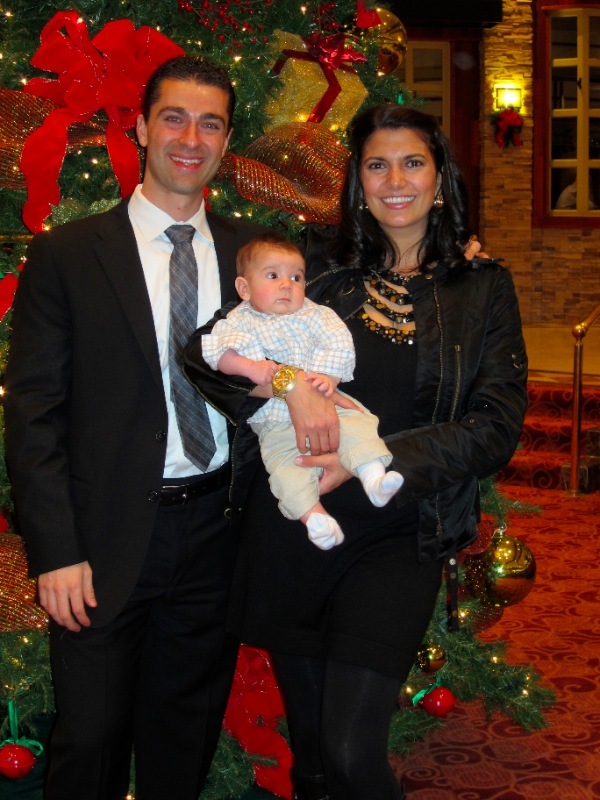 Your family is so stinkin cute! 🙂 Love the mohawk look. He is adorable! I think every mom feels overwhelmed/wants more energy, so hang in there. Raffi has the greatest smile ever! I am 23 weeks pregnant and love reading your updates! wow Sabrina, you look absolutely fantastic! You guys should be on a hallmark card, with all of that oozing cuteness! and of course, batti le mannine is a staple in all italian households, my friends who arent italian often give me weird looks when they see me singing that to their babies! 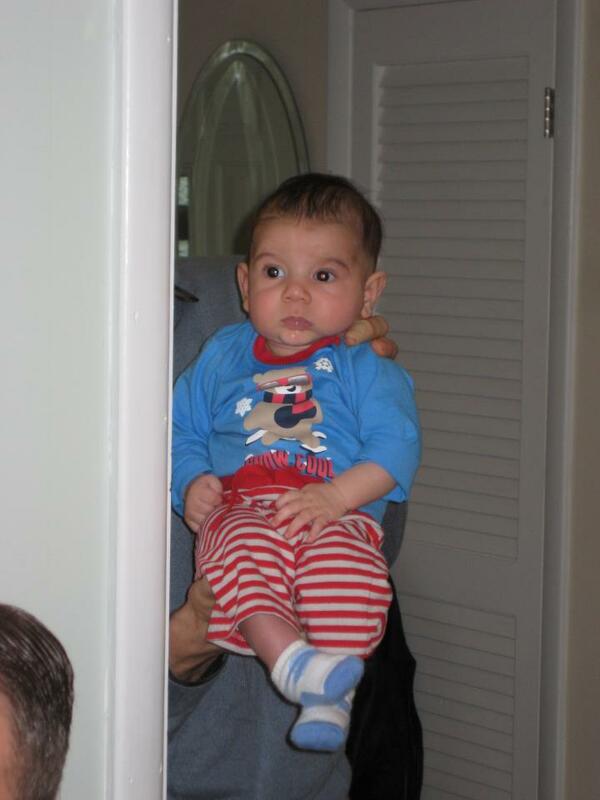 I love the floating baby trick – especially with that face. Adorable!!!! SO SO SO adorable! Sounds like you are doing a great job, as always. We’ve just hit a little sleep regression and hoping it passes soon! He is so adorable – I love his smile! Oh my! He has the cutest chin! 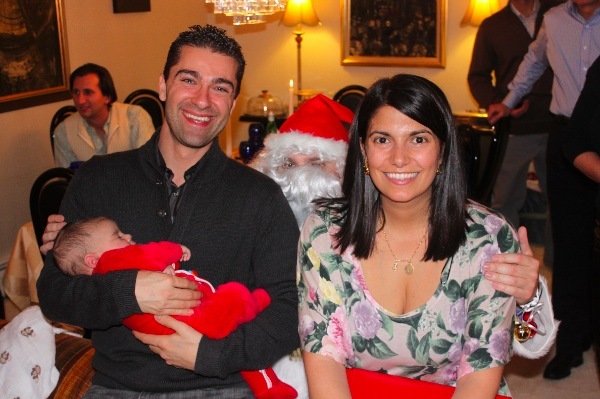 Just remember that a happy, growing baby means that Momma is doing a great job and Raffi looks very happy and healthy! We have the boppy too and I love it. Sofia is just over 5 months and when she was about 4months we started sitting her propped up but with the arms of the boppy around her and the “front” of the bobby facing her her tummy – then we give her a book. The boppy helps to support her and the book and she loves it. And we get lots of giggles because it almost looks life she is reading!